Fluid trapped behind the eardrum is a breeding ground for bacteria and infection. We hBeing a quality-oriented organization, we are engaged in providing a wide array of Metal Grommets. Our offered button is availed in a variety of sizes, dimensions and other such specifications to choose from. This is precisely designed at our highly advanced manufacturing unit following industry defined guidelines. This made of EPDM for good heat and weather resistance and supports the hood of the bonnet and prevents metal to metal contact between the bonnet hood and the bonnet, thereby eliminating noise and vibration. Mahindra & Mahindra Scorpio and in other vehicles. The Steel Grommets exported by us are intricately designed using technologically advanced machinery and tools and bear excellent finish. These are durable, corrosion resistant and are in high demand in the market. Our unmatched quality range has helped us in achieving a broad client base all across the globe. 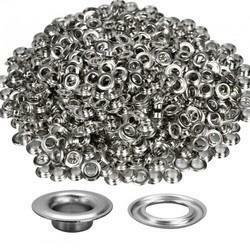 We are recognized as a reliable Metal Grommets Trader in New Delhi. The Metal Grommets, we offer, are obtained from trusted vendors, who made by using well-tested raw material. We offer the Metal Grommets in different designs & patterns to meet the varying preferences of the clients. We provide the Metal Grommets in proper packaging and at the market leading prices. We are presenting an excellent quality range of Metal Grommet. The Metal Grommet we offer is available in various sizes and specifications. These products are made by using high grade material and known for their corrosion resistance. These products are easy to install.